From baby calmers created for BC Women and Children’s Hospital to an electronic starting system for the Burnaby Lake Rowing Club, the news-making products developed by BCIT Applied Research team MAKE+ are often just that: products. But there’s a second—equally important—part of the research team’s focus that often goes without fanfare. It’s that process development piece—also known as “service design”—that sometimes fails to capture the headlines. 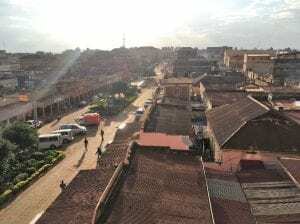 Mbale, Uganda, home to the District Health Office and home base for BCIT Research Associate and Dr. Nicolas Christofi during the project. MAKE+ Research Associate Lisa Boulton has a keen interest in service design, and currently specializes in front-end design research. That focus, along with a background in health informatics, made Lisa the ideal person to take on an exciting new international project. With a background in medical clinical research and noticing a lack of supplies during a visit to the regional referral hospital in Mbale at which his wife was completing a midwifery internship, Dr. Christofi was working with Ugandan research centre SAfRi to address concerns surrounding their ability to maintain medical supplies and essential medicines for the most basic of treatments. “Faced with the lack of supplies, [healthcare providers] are often left feeling helpless and unable to treat patients,” says Dr. Christofi. 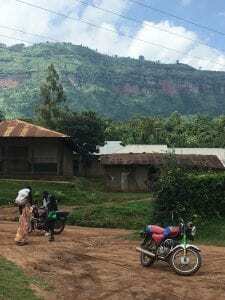 This project took Lisa and Nicolas to many remote health centres, including this hilltop centre in the Mbale region. Dr. Christofi was in agreement: without the buy-in and active participation of local communities, he knew he’d be blind to the realities of providing medical care in this particular environment, ultimately resulting in an incomplete solution. He had visited each of SAfRi’s remote health centres shadowing one of their researchers, Odeke Mackayi, and had conversations with care providers about their critical concerns in being able to deliver care, primarily their ability to maintain medical supplies and essential medicines for the most basic of treatments. Mt. 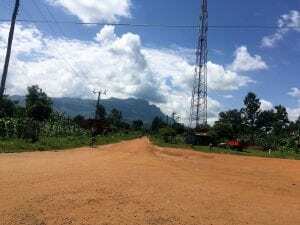 Elgon is visible en route to another health centre visit. The resulting maps highlight critical areas: for example, where increased labour is needed, or where a diminished ability to deliver care exists. “This laid the framework for solution generation,” says Lisa. “The product here is a map that charts the communication, infrastructure, people and physical products in order to deliver a service—in this case the provision of medical supplies and medicines,” explains Lisa. 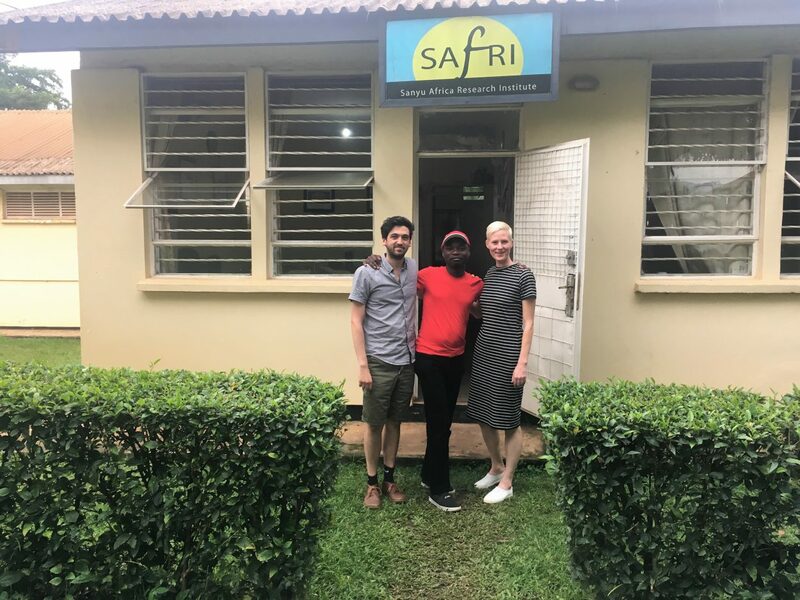 With research results in hand, Lisa and Nicolas met with the Mbale District Health Office to present their findings as well as possible solutions. The team’s three proposed pilot projects received government approval in June 2018. Wendepunkt Medical Innovations has signed on to work with local research partner SAfRi to digitize existing analog records, implement transport solutions for drug supply, and automate systems to support the effective delivery and ordering of medicines and supplies. Wendepunkt is currently working to grow its funding and will return to Uganda to further investigate technological requirements this spring. The resulting “product” of Lisa and Nicolas’s work may not be a physical prototype, but it has tangible benefits nonetheless. Learn more about Lisa’s work in this short video. BCIT Applied Research is known for finding collaborative and innovative solutions to industry challenges and is integral to the Institute’s unique education model—enhancing the student experience through hands-on learning opportunities that solve real-world problems. BCIT Applied Research is critical to the growth and success of BC business, working with over 100 small-to medium-size enterprises every year. Applied Research team MAKE+ is a group of multidisciplinary research staff focused on product and process development, evaluation, and education. The group works on a huge variety of projects out of the Centre for Applied Research and Innovation, just across from the main BCIT Burnaby Campus. MAKE+ contributes to ethical and innovative product development projects globally. Want to collaborate? Visit our website for more information.